My favorite Guinot facial is our new LIFT SUMMUM treatment. It’s a great facial suited for lacklustre, dehydrated or ageing skin. The LIFT summum facial is an exclusive skincare method that provides global firming action and immediately attenuates signs of fatigue and aging in the face, neck and décolleté. After a 50 minute treatment the face is visibly younger-looking, fine lines and wrinkles are smoothed away & the skin on the face and décolleté is visibly firmer, plumper and lifted. 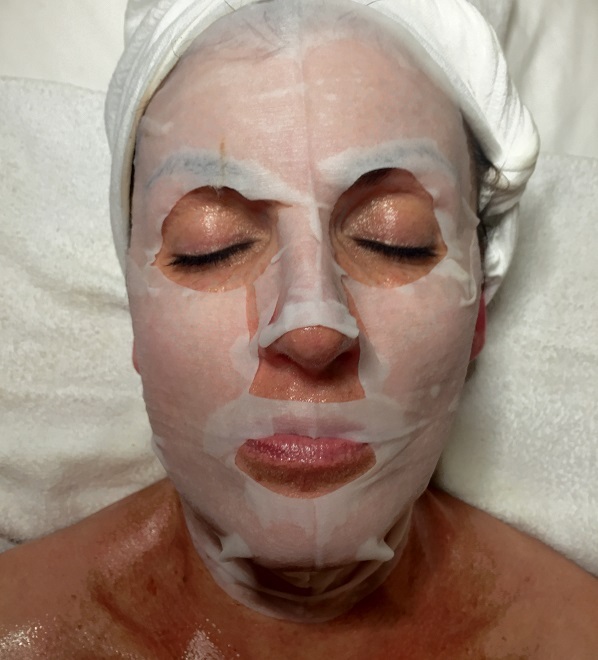 This facial has 2 important key ingredients that give this facial a unique treatment. – Mahogany Bark: This ingredient helps stimulate collagen synthesis which improves skin elasticity, tone, and helps counteract slackening. –Alaria Esculenta: This seaweed extract helps to regenerate collagen and elastin fibers while fighting outside aggressors. Aids in the prevention of wrinkles. This is a seriously luxurious experience that leaves you with the skin to prove it. – STEP ONE – Double Exfoliation: In the first phase of this treatment, papaya extract breaks dead cells away from the skin to facilitate exfoliation. Microparticles of cellulose remove dead skin cells mechanically through friction. Fruit acids accelerate shedding and boost cell renewal. – STEP TWO – Massage: The second phase includes a massage with mahogany bark extract to improve skin elasticity to help counteract slackening, while alaria esculenta seaweed extract helps prevent the appearance of wrinkles. – STEP THREE – Filler/Eraser: The third phase embeds hyaluronic acid spherical fillers into wrinkle grooves. The fillers then rehydrate and inflate to fill the wrinkles. – STEP FOUR – Firming Mask: The fourth and final phase utilizes dynalift and a biotechnological complex to smooth facial features and combat skin slackening by forming a mask that lifts. Eyes are the focal point of the face. Unfortunately, they also portray signs of age and fatigue through wrinkles, fine lines, dark circles, and puffiness. Guinot’s new Eye Logic treatment targets these three concerns for a more youthful and energized appearance. The Eye Logic Treatment is a contouring treatment that targets the very delicate eye area in just 40 minutes. This 3 Step Treatment will help eliminate wrinkles, puffiness and dark circles around the eye area. A special eye serum gel paired with ionization through Guinot’s pattented electrodes helps drain puffiness around the eyes, decongests dark circles, and smoothes away crow’s feet, wrinkles and frown lines. An eye contour massage tones the skin, stimulates tissue drainage, and activates sub-cutaneous microcirculation to reduce puffiness and dark circles. An exclusive patented shaped eye mask releases the rejuvenating active ingredients deep into cells and creates an instant lifting and firming effect. The skin around the eye contour is thinner and more fragile than the skin over the rest of the face. The area is poorly protected and highly exposed (wind, sunlight, etc. ), making it easily subject to signs of aging. The accumulation of water causes eyelids to swell, which is accentuated by fatigue. Dark circles are caused by excessive dilation of blood vessels on the skin’s surface that become visible. The poor circulation stagnates and intensifies the bluish color characteristic of dark undereye circles. The Super Hydradermie is a great facial to get rid of all that dry, dull skin that has been building up over the past few chilling months. It combines the exfoliating peel of the Beaute Neuve Facial and the deep cleansing and hydration of the Hydradermie Facial. This is what I like to call “The best of both worlds.” The peel contains a gentle mix of fruit acids including Glycolic and Citric acid. Glycolic Acid is an exfoliator that removes the outer layer of dead skin cells, resulting in fresh new skin. It can also help lighten skin discoloration, such as sun or age spots, as well as help those with acne-prone and blackhead-prone skin. Citric acid contains vitamin C, which is considered to be a very powerful antioxidant that can stimulate collagen production, plumping up the skin. This fruit-acid exfoliation is then balanced by a neutralizing treatment foam, that removes the dead skin cells that the fruit acid has been breaking down, and leaves the skin looking brighter, and healthier. After continued treatments the appearance of hyper pigmentation will begin to diminish. Once your skin has received this gentle yet thorough exfoliation, the deep cleansing of the traditional Hydradermie begins. Your Esthetican uses galvanic current and customized gels, based on your skin condition. The current not only allows the treatment gels to penetrate further into the skin, but it also helps to pull impurities out, making extraction (if needed) much easier. Following the current, an oxygenating cream is applied and a high frequency wand is passed over the skin for several minutes, to further oxygenate and soothe the skin. The facial finishes with a individually prescribed mask and followed with an appropriate moisturizer, protecting the skin from the outside elements. 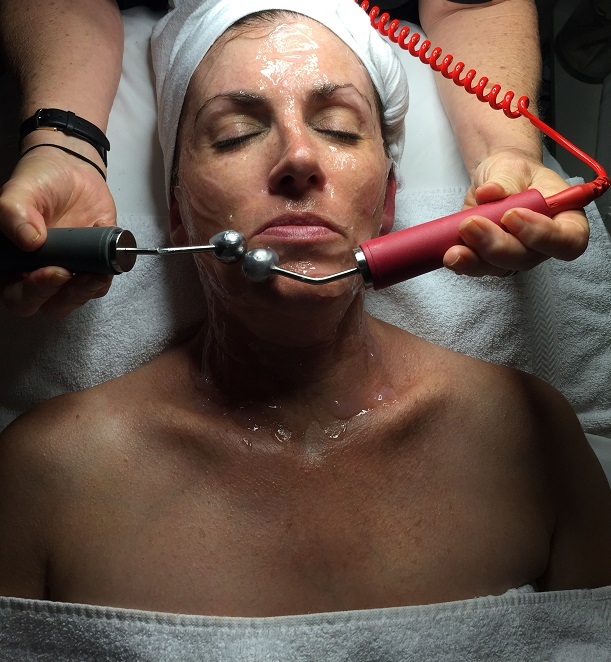 The Super Hydradermie is ideal for clients wanting a deeper exfoliation, improve skin texture, even out their complexion, and increase overall hydration.